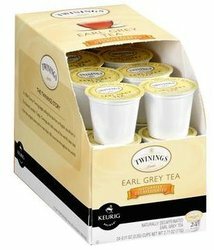 Twinings Decaf Earl Grey Tea K-Cups. A light & aromatic blend of fine black tea, scented with bergamot, a citrus fruit. Each box contains 24 single serve K Cups.